The ladies over at Curvy Girl Guide are "getting real". Audrey wrote this post that really struck a chord with me. Her post talked about how weight can be "a source of secrecy and shame". She asked some bloggers if they would be willing to share their stats and photos with her. Over 2 dozen women shared photos... AND their height and weight... for her post. (Read the post... really... and then come back... I'll wait.) I decided I had to share a little too. Once upon a time, a long time ago (before I had Ana, before I had Zoe, before I got married)... I went to Weight Watchers. I was quite successful. I was a stickler about the points, and the servings, and the water, and the activity. I lost almost 40 pounds... and was down (at my lowest) to 130 pounds. Anyway... I got married and relaxed a bit. I gained a little weight. But... I was comfortable with myself. I think I floated around 140 lbs. Then...I got pregnant with Zoe... and I gained weight. I gave birth and I lost the weight. Well... some weight. I got stuck around 170 lbs. I tried Weight Watchers again. I thought "I did it before, I can do it again. Maybe." I made a decision, though. This will sound strange... but I wasn't REALLY happy at 130 lbs. Don't get me wrong... I liked the appearance of 130 lbs. But, I was neurotic about writing EVERYTHING down in that WW journal. It made me anxious... trying to stay at goal. I worried about food. I thought about food ALL the time. It took every bit of will power in me to stay near 130. So I said.... forget 130. That seemed unreasonable. I figured my happy goal could be 150 lbs. Well, the WW people didn't like my goal of 150. It technically was 2 (or 4? I can't recall exactly... it was over 5 years ago) pounds over the healthy range they had for my height (5'4"). They said I could put down 148 (or 146?). I don't know why... but those 2 (or 4?) pounds on paper just really threw me off. I just couldn't do it. I couldn't focus. I thought "I just want to be a happy 150. Why can't they just let me do 150? 150 is doable" I tried a little... but not enough. I stopped going to the meetings. Then I got pregnant with Ana... and I gained weight. I gave birth and I lost weight. Well... not really much more than that baby and fluid weight. This time I got stuck at 180.5 lbs. 2 1/2 years later and the scale just taunts me. I watch what I eat... 180.5. I eat like a crazy person (where DID all of those girl scout cookies go?)... 180.5. (And that .5 TOTALLY pisses me off.) It just doesn't seem to matter one bit what I eat... that scale just looks back at me and flashes 180.5 lbs. I finally had enough of the 180.5. I'm uncomfortable with myself. I'm not happy being the chubby mom. I'm just not happy. Something needs to change. 12 days ago our new treadmill was delivered. It is big and bulky. To make it fit in our house we had to rearrange our bedroom in a way that bugs me. For the first day it existed in our house I couldn't do anything more than look at it and hate it just a little bit. It has been in our house for 12 days. I have walked 30 minutes per day on 10 of the last 12 days. This morning I got on that scale and instead of flashing the number it's flashed at me for the last 2 1/2 years... it's flashed at 178.5 pounds. That feels like the biggest 2 pound accomplishment of my life. Sharing that here for public viewing makes me feel good. That was the one thing about Weight Watchers that I always felt helped push me towards losing weight. Going to the weekly meeting, stepping on the scale, and having someone else see what I had done. Even just that 1 lady each week that looked at my scale and jotted down my weight. The accountability. Giving up the secret. So... 9 years, 1 marriage, 2 kids and 50 pounds later... I'm putting it all out there. I'm 38 years old, 5'4", 178.5 lbs. 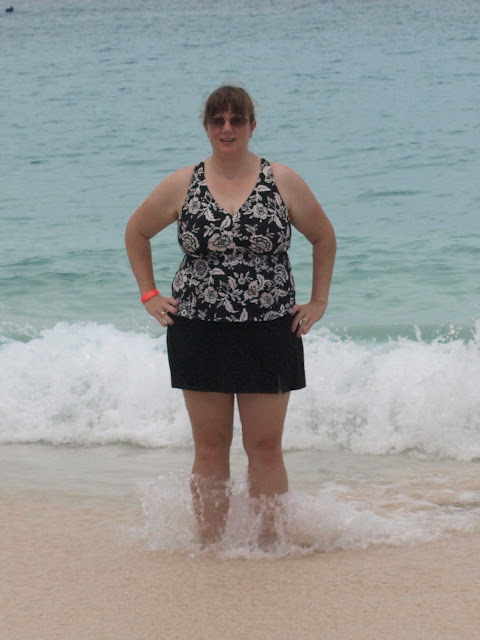 And... it seems, the most recent (almost) full body photo of me is from last August. Gotta fix that too.